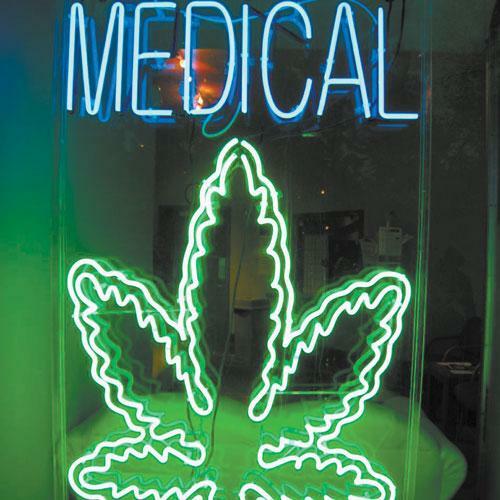 I won't tire you with the arguments for medicinal marijuana. Pot is useful for treating cancer, MS, AIDS, and epilepsy symptoms. For pain: backaches, knee aches, heartaches. It slows Alzheimer's, eases anxiety, and makes you thin. And it's all-natural! It's the miracle plant! And some of these things are true. But I expect, like a lot of the typical claims of naturopathy, a lot of it is quackery. As for the arguments against medicinal marijuana, well, there just aren't any good arguments against it. In fact, the arguments against marijuana are so weak, there's really no reason to settle for just legalized medicinal use of marijuana. Pot should be decriminalized. Pot should be legal. It's – what? – 2015 now and just about every one of you reading these lines smokes pot, has smoked pot, or been around pot-smoking friends. You know what I know: it's a relatively harmless drug. So I don't need to look up those studies that show decreases in violent crime and traffic fatalities in areas with legalized marijuana, do I? Do I have to remind you that you can't OD on pot? Do I have to trot out the medical studies showing that pot isn't anywhere near as addictive as tobacco or alcohol? And should I go to the social costs of outlawing the drug? Maybe you know these facts, as well. That hundreds of thousands of Americans each year are arrested for the possession of this relatively benign drug? The billions in taxpayer dollars spent housing them in prisons? The wasted lives, the economic loss of their work and productivity? The damage done to society? The marijuana policing that disproportionately targets African Americans? The case is so obvious, even the New York Times called for legalization last summer. "It has been more than 40 years since Congress passed the current ban on marijuana, inflicting great harm on society just to prohibit a substance far less dangerous than alcohol," wrote the Gray Lady's editorial board. "The federal government should repeal the ban on marijuana." That's the easy part. Lifting the ban. Here's the hard part: legalizing. It's not just a simple legalize-it-and-go. There are a lot of administrative structures to create. Licensing. Taxing. Oversight. Regulation. And these things are causing headaches for the states – Oregon, Washington, and Colorado, for now – that legalized pot. In Washington, for example, the slow process of licensing pot dispensaries and the heavy tax rate and onerous restrictions placed on them has caused very slow growth of outlets for the legal sale of pot, and a much lower than expected tax revenue. And then there are the questions of how to regulate doses and how to label marijuana. We all had a good laugh at Times columnist Maureen Dowd when she went to Denver and had a bad trip after eating a pot-laced candy bar: "I strained to remember where I was or even what I was wearing, touching my green corduroy jeans and staring at the exposed-brick wall. As my paranoia deepened, I became convinced that I had died and no one was telling me." But the column had a good point, even if it was like watching a snippet of "Reefer Madness." Labels on marijuana products in Colorado, for example, are notoriously inaccurate. And new users of marijuana edibles may not know – like Dowd! – what the labels are telling them anyway. Eating marijuana gives a much more potent and long-lasting high, something you don't get from an old-fashioned joint or bong hit. And the legalization of pot hasn't turned out to be a quick solution to the ill-conceived "War on Drugs." For starters, illegal trade of marijuana hasn't stopped in places where the ban was lifted. In Seattle, Washington, for example, black market pot dealers find that their business is thriving – especially with licensure for legal distributors dragging and the price of legal marijuana sometimes twice as much you'd pay a shady dude handing out baggies at strip clubs. Smuggling still exists, too: Colorado, Oregon, and Washington are being used as bases for the transportation of pot into other states. And police are still making marijuana-related arrests. Yes, arrests for criminal possession and distribution are down significantly, but dealing without a license and outside state-mandated guidelines is still a felony in those states. Additionally, in Colorado for one, public consumption of pot is illegal – and those being arrested for it are disproportionately African-American, according to a 2015 Drug Policy Alliance report. Those that were arrested in legalized-pot states before the ban was lifted are still languishing in prison, even for relatively minor possession offenses. The arguments against marijuana are so weak, there's really no reason to settle for just legalized medicinal use of marijuana. Pot should be decriminalized. Pot should be legal. Of course, even with legalized marijuana, the War on Drugs continues on in all states. The federal government still considers marijuana illegal, and all states criminalize possession for other illegal drugs. Possession still carries high penalties, and federal civil forfeiture laws still allow federal authorities to seize property of suspected drug users or dealers without conviction. There is one addiction that proponents of legalization don't talk about much. And that's the addiction of state budgets to tax revenue. We've seen it in Pennsylvania around state liquor stores and across the nation with state lotteries. Once a state relies on the tax revenue, making any real change to those tax sources becomes all the more difficult. So, yeah. Let's go, pot! Legalize it! But let's not snap on the blinders and think that legalization cures all ills. In fact, any reasonable legalization effort should be prepared with a good plan on how to license, tax, and distribute marijuana, and with an eye towards coupling legalization with prison and drug treatment reform. And then let's split some brownies.